A good freind of mine just received a set of Callaway X2 for Christmas and gave me his set of Air Bears. We shote this last weekend and i have to say that i was very pleased with the performance of these clubs. My distance and accuracy improved 60%. Great set of clubs if you ask me. here's a review from Germany. I bought my set of Air Bear irons on ebay this year for €90 Euros. They're fantastic. I hit them straight and far right from the start. I constantly drive out my partners when we hit irons from the tee. Unbeatable for the price you pay for them now. Had a friend recommend the Air Bear irons... he LOVED them. I found a set of the GB Professional Nickel Steel with Mid-firm graphite for $99 at a local used shop in 8.75 condition... these irons are SWEEEEET! The feel of the nickel steel is very soft, much like forged. These irons are a 1/4 inch long (5 iron 38.75") and are almost one full club longer in distance than comprable sticks. Very well balanced, great looking club head design, minimal offset, graphite shafts are by UST, quality stuff, and they look great. And the grooves really put some nice spin on the pellet! I think Nicklaus stuff may be a big time sleeper brand. I played the old original N1 irons some time ago and they were really nice too. I recommend these (and the Air Bear) irons to anyone looking for a great set, no matter what your budget is. These irons are better IMO than many REALLY expensive sets, and I have owned or played most everything! I keep a set of Titleist 695's for when I prefer steel shafts... great, but the GB's are right there too. 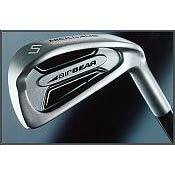 Have had my air bear irons for 8 years. When my game is on they deliver high, long, straight shots. An excellent club for the money. Good looking as well. I am 70 years old and can hit my irons as far as the much younger guys I play with. Great clubs for juniors. The irons are very powerful and light compared to the big brands. It is also economical and durable which gives it great value. The clubs have a big sweet spot which enables me to hit around 190m with a driver. I recorded my best result of +4 with these clubs. I just started golfing, and this is my first set of clubs. I got them used on Ebay. Offset oversized heads with regular graphite shafts and tourwrap grips. I like the clubs a lot. It's taken sometime to get me swing down, but these clubs have helped all the way. I recommend them for anyone starting to learn the game. I've learned I'd rather have the harder and thinner rubber grips because I have small hands, but I think I'll keep these for a few more seasons before changing the set over. The grip size is good enough for now. The clubs have a very soft feel when hit well, which is not that hard to do once you get your swing down. weight is good for me, I'm small and lean. Finally it's a good looking club, not a Calloway or Mizuno, but a very respectable club on the course. For what I paid for this used, left-hand set (3-pw), about $70, I got a pretty good deal. Great irons! Have had these for a year, tried many other clubs, but nothing comes close! I have tried the "big name" brands but just cant let go of my AirBears! These irons lowered my score at least 5 strokes below any other club. Very forgiving and straight, distance is right on, I can basically call my shots now. Go try them! Been playing 4 yrs and these were my first set. They are quality clubs for a beginner seeking forgiveness on off center hits at a reasonable price point. At this point, looking for more feel, hence a forged iron. In relation to other clubs the Nicklaus Irons do fall short, but for the money (seeing that you can get a good deal) are more than worth it. The irons have a moderatly large sweet spot and are relatively light. Shafts, as usual, do wear with time. Reshafted seven and sand wedge.